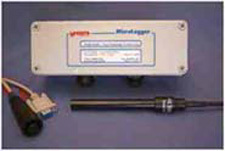 The 6536 Water Conductivity Recorder is a complete measurement system suitable for permanent field installation. Graphite electrodes, combined with zero potential measurement technique, maximize stability and reduce effects due to algae growth and other water pollutants. Three built-in ranges allow the one instrument to cover a wide range of conductivities. Autoranging means the instrument works at its optimum resolution throughout the operating range. This enables monitoring of saline conditions while still accurately measuring flushes of fresh water. Temperature is measured within the sensing cell to provide precision correction. Both temperature corrected and uncorrected conductivity measurements are available for recording.